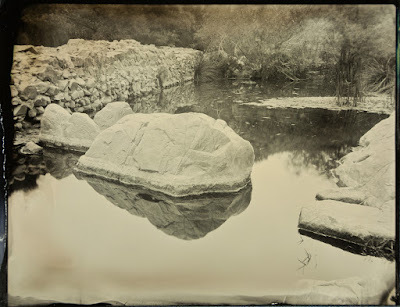 This post is about two quick collodion-related tests I did recently. The picture above is confusing, I know – it might lead one to believe the two halves of image are, when in fact they aren’t. It’s ok though, hopefully it got you intrigued and reading the post will clarify everything. 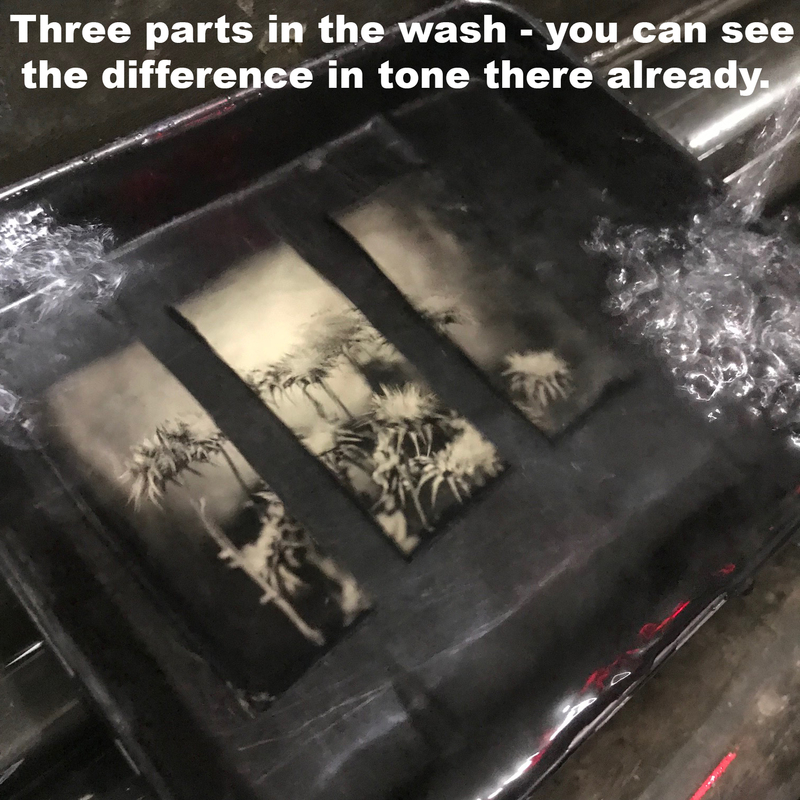 Test #1 – Adding Acetone to Collodion to Bring Back Speed. The solution people suggest to bring the speed back is to add ONE DROP of pure white acetone per 100ml of collodion. Let it sit for some days while the reaction is going, and you’ll actually see it going from red to more orange and then to yellow. I had 200ml of this super-slow red stuff, so I split it into two equal halves. My memory failed me though, and instead of adding just one drop of acetone to my 100ml, I added 1ml (actually a little more), so over 10x the recommended amount!!! It still took at least 5 days to reach yellow and gain speed. A few notes. People say that adding acetone will make your emulsion more fragile and some also say that it will make alcohol-based varnishes dissolve the image. 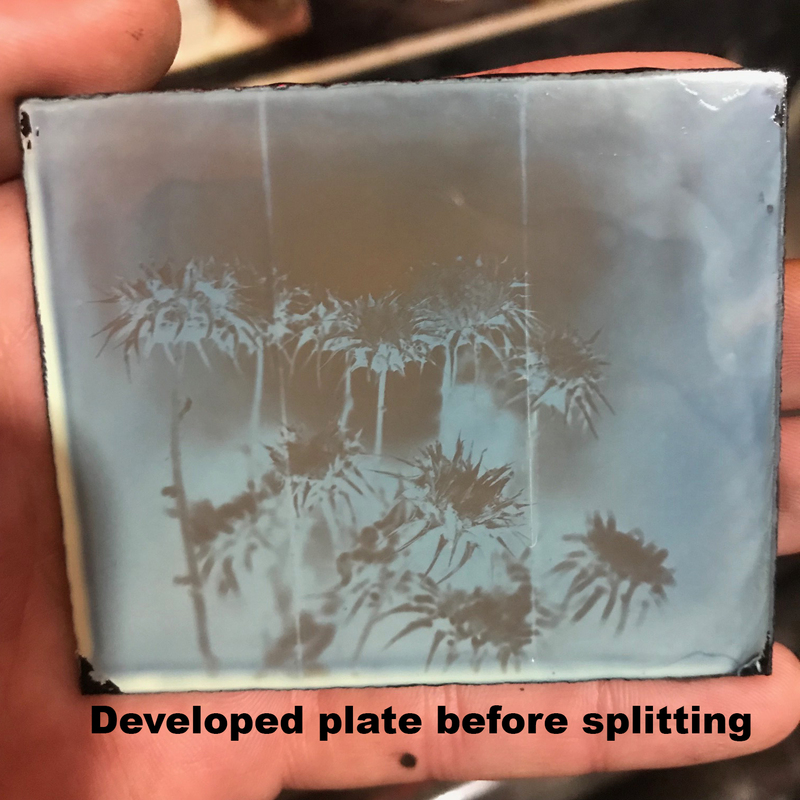 What I found (and this is after adding WAY more acetone than recommended) is that my emulsion did in fact become A TINY BIT more fragile (less pressure was needed to scratch wet emulsion with cotton ball while wiping off oysters, for example), but the difference seemed really insignificant. 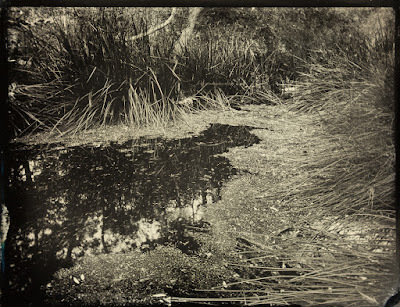 No images were dissolved with varnish (I use traditional sandarac formula). I think the dissolving issue is probably unrelated to acetone. 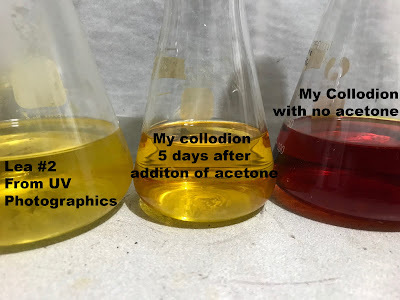 Dissolving is most likely stemming from the fact that by the time most people try the acetone trick, their collodion has been sitting for many months or even over a year, and by then nitrocellulose actually started to deteriorate. My actual collodion was new, so nitrocellulose was fresh and acetone didn’t make it be re-dissolvable again by varnish. 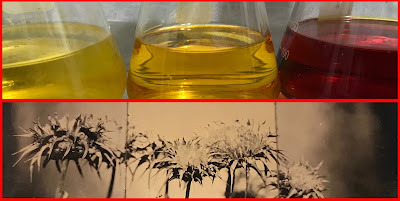 After I did the test and the collodion with acetone performed at ISO 1 like new, I actually combined those refreshed 100ml with the other 100ml of deep red. Seeing how I had 10x more acetone in there already, I didn’t add any more. It’s been about a week now and the whole mix is light orange. 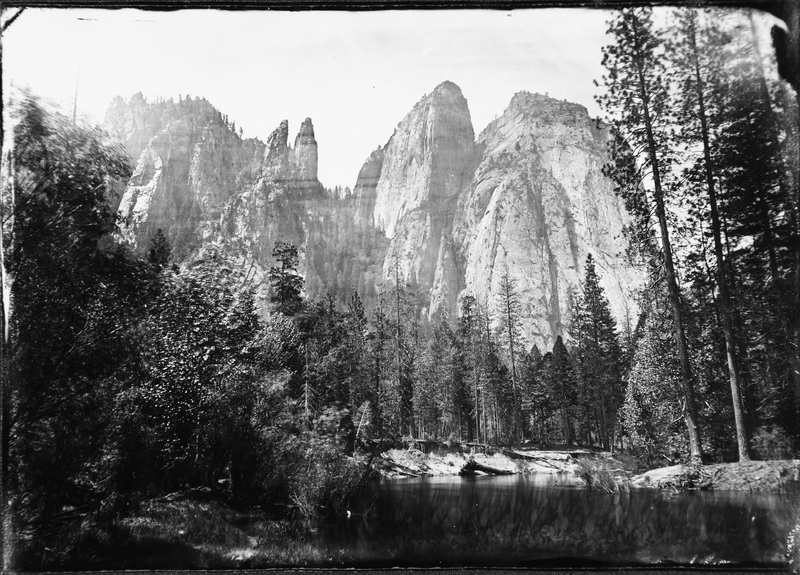 I shot Mission Dam plates with it the other day, and basically was shooting at ISO 0.75, so I’ve recovered over 2 stops from its deep red state. All the plates varnished wonderfully. I think in a few more days it’ll get to bright yellow, and back up to ISO 1. 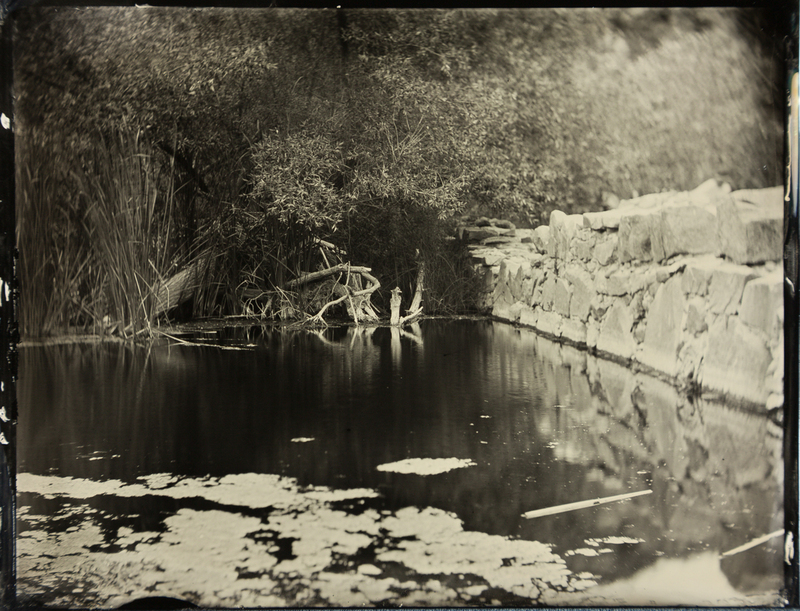 TEST #2 – Three Fixers and Their Effect on Plate Brightness. A number of years back, when I was just starting my collodion journey, I saw Alex Timmermans’ Three Fixer Test as related to the eternal quest of wet plate photographers to get the brightest possible silver deposit in final image. 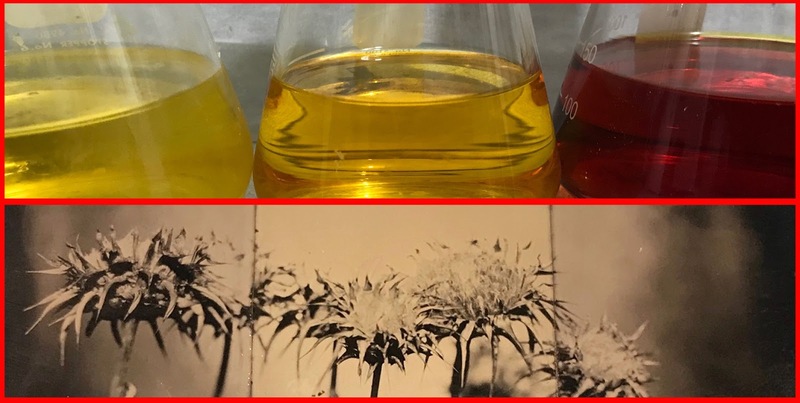 The debate is always – is there a way to get around using KCN (KCN is potassium cyanide and is very poisonous) and still have bright warm-tone images. Alex’s test seemed to show barely any difference in the final look of the image. KCN seemd a tad brighter, followed closely by Amoloco and Sodium Thiosulfate (Hypo). It seemed so close though, that for years I’ve been telling people that it makes barely any difference. Personally, I started using KCN from the start – if you are careful with it, there’s really no danger when working with it. I like how it works, I don’t need to wash my plates too long (as it washes out 4x quicker than conventional hypo), and it’s also very quick-acting, which always is a visual bonus when making plates in front of people. However, a short while ago, someone with vast amount of experience did make an online remark that made me want to do my own test and see live what the difference really would be. The way I went about it is very simple, I pretty much followed Alex’s test procedure. 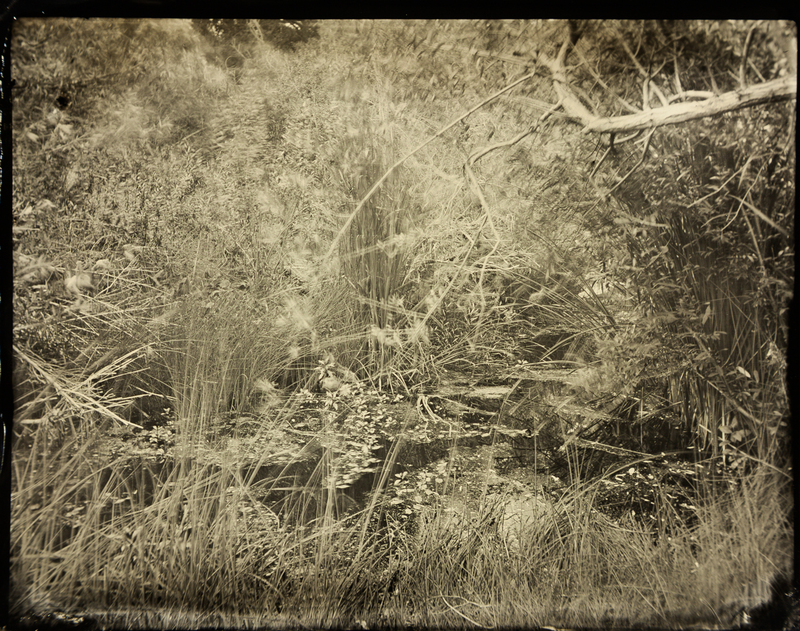 I had the same Lea #2 collodion that was used as comparison in Test #1. 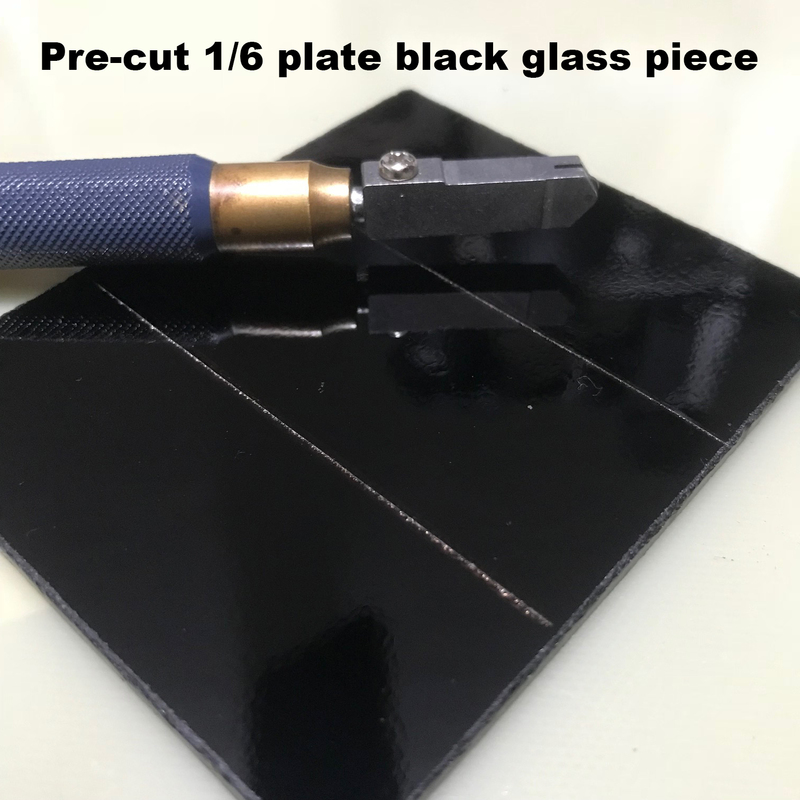 A 1/6th plate size piece of black glass was scored in two places, so that later it would be easier to break it into three pieces. Using strobe lights, I made one test plate to dial in proper exposure and then made the final exposure on the pre-scored glass. After development, the plate was rinsed copiously and then split into thirds. Left part was fixed in Sodium Thiosulfate (Hypo), middle in KCN and right side in Ilford Rapid Fix. 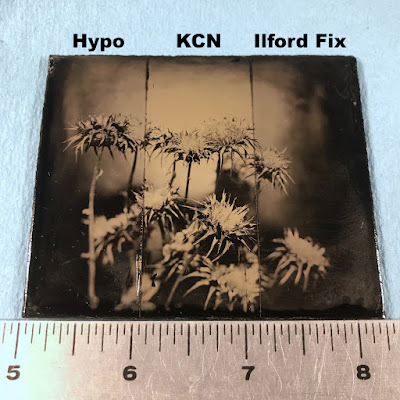 To my surprise, I saw much greater difference than I expected, with KCN showing its usual bright creamy tone, but both Hypo and Ilford tones were duller and almost into the purple range when compared to middle section. Varnishing with sandarac (last pic below) did seem to bring the tones a bit closer together, but brightness is still visibly different. 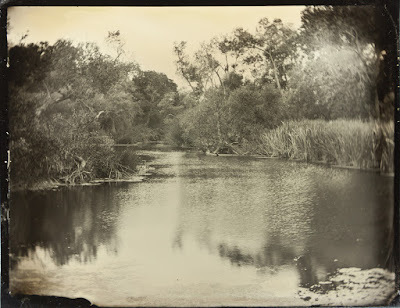 This morning I was invited by Race and Ashton, my local buddies, to go fishing at the old San Diego Mission Dam. I’m by no means a fisherman, especially being allergic to seafood of any kind, but I thought it would be a perfect opportunity to finally take the box I made for Europe Trip a couple of months ago for its first test on home soil. 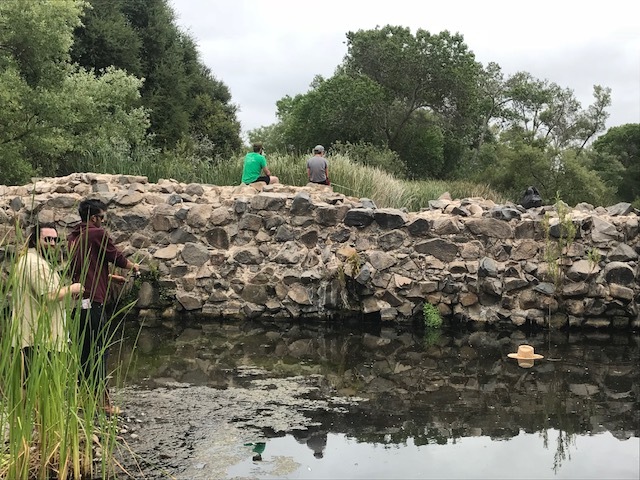 The 203 year old dam is now surrounded by Mission Trails Park, great place to hike by the way, and, though water barely flows this time of the year, there’s still some great little nature vignettes, which one can find if they get off the beaten path far enough. The over-the-shoulder dark box setup is perfect for such excursions. I got very lucky, and all day the low marine layer clouds kept the sun at bay, while still providing plenty of UV for collodion. 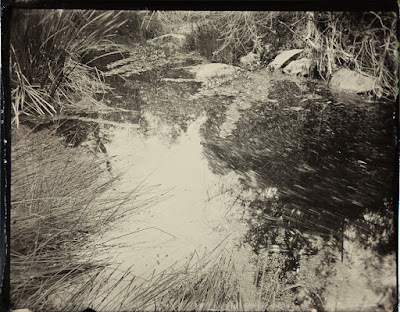 Race and Ashton cast their poles into the murky pond waters, and I set up my operation under a small tree upon gravel of a dry river wash. Here’s my first plate and the darkroom setup. Meanwhile, Race knocked off his hat into the water while swinging his pole, leading to a lively rescue operation that saw the biggest catch of the day as the result. Here, the target is being zeroed in on by Ashton. They continued to exert efforts of hooking a fish for a while, which gave me an opportunity to make a total of 7 plates including the one you see above. 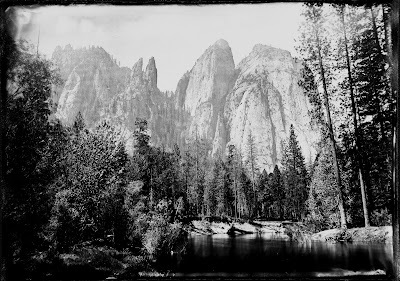 All of the plates were secured on first try, except for one of the compositions, the ‘up the river shot’. I really wanted to use a Petzval with wider aperture to get the certain look, and thee scene was so bright that I had to try a few times before I got my lens cap shutter technique down to yield an approximately 1/4sec exposure. 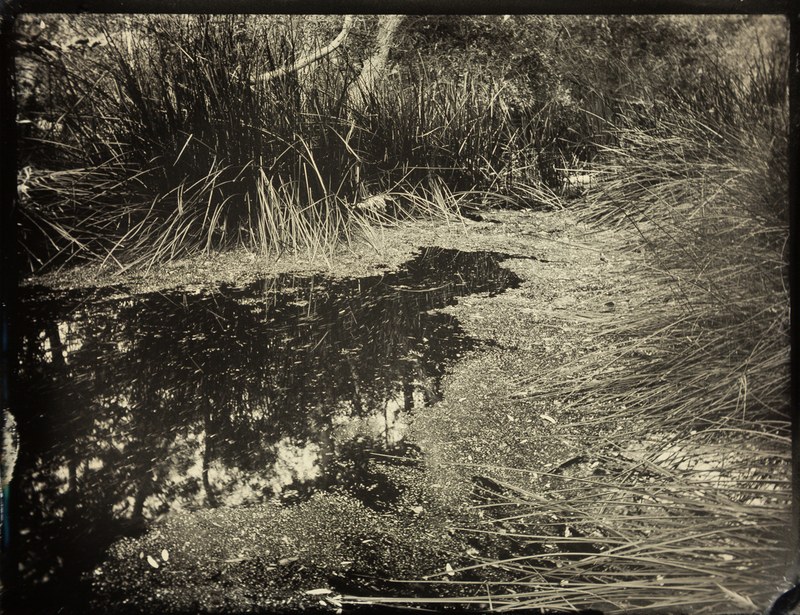 By the way, today’s images are all 4x5 in and were made with either of the following two lenses – Wide Angle RR Dallmeyer 1aa (4in focus) and a 7in Voigtlander Petzvla (stopped down for all exposures to 5.6). They were copied after varnishing using a Canon 5DII, and color and tone adjusted in Lightroom to match the final look as close as possible. After getting back from Europe, it wasn’t a week until Conrad Young (local wet plate photographer) had a little adventure planned for us, which would take us by Will Dunniway’s place for a day and then just a day of shooting in beautiful Yosemite. Since my girlfriend, Jozlynn, hasn’t been there yet, she was glad to come along as well. Will Dunniway has been a pillar in the world of wet plate collodion for close to three decades now. He has taught numerous masters and influenced many more. Will is a very traditional shooter and his work is outstanding. 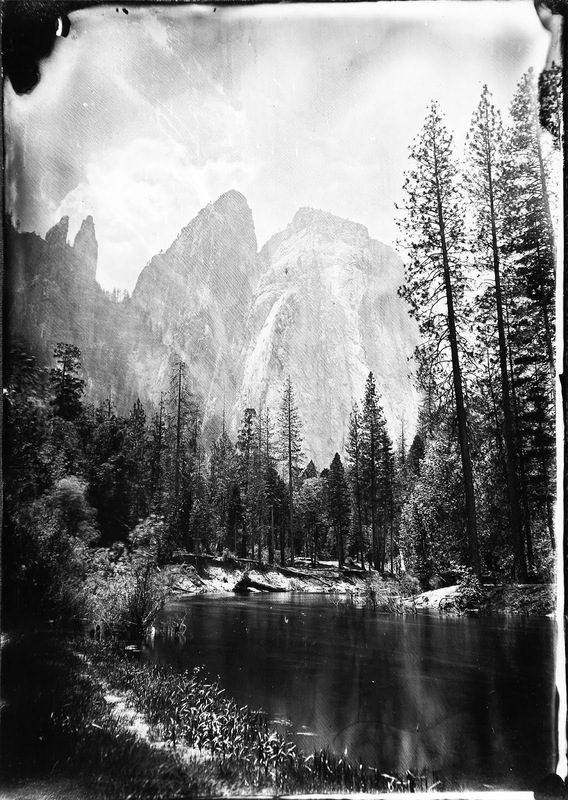 Not long ago he moved from Los Angeles to the hills just south of Yosemite, so now it’s a pretty good trek to visit him, but it’s really worth it – he’s a kind soul with immense knowledge about collodion and many other topics. When visiting Will, Conrad and I got to pour our first 11x14 plates (a little project, which is not to be publicized, that we helped with). 11x14 is fun! A lot of ether fumes… It was a long drive from San Diego, so for the rest of the day we just relaxed, and headed to bed early in order to get to Yosemite early next day. 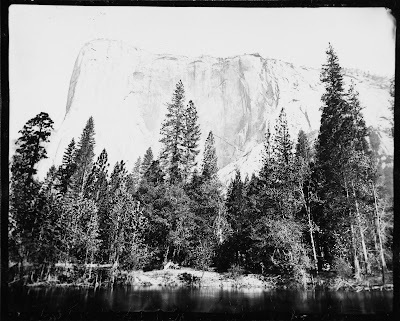 Will told us of a beautiful secluded spot in the middle of Yosemite Valley, from which three peaks can be photographed, and that was our first stop. After lugging the gear from our car to a little meadow a few hundred feet away, Conrad and I set up our dark boxes and went to work, while Jozlynn painted. At this location I made 6 positive plates (1 4x5in and 5 5x7in) and 5 5x7in negatives (one scene photographed twice). Below are the plates and first prints from the 5 negatives. 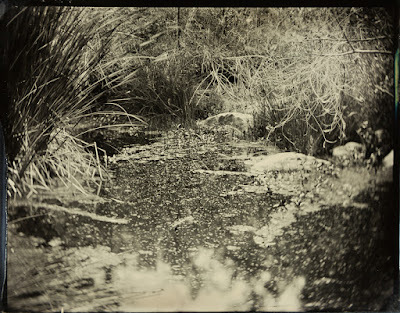 These are just first proofs, they were made on Kodak AZO F1 paper. I plan on printing them more seriously in the future, but this is a good representation of information in final prints. 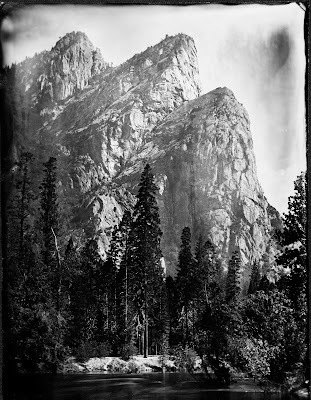 The plan initially was to shoot at least in 3 locations, but the meadow was so serene, and views so spectacular, that, after packing up, we only had time to drive a bit farther, and into a spot where a good view of Yosemite Falls could be seen. Everywhere except for the meadow tourists were teeming, so the sense of awe in presence of such magnificent landscape was somewhat muted in intensity. The particular parking lot we chose was relatively small, and so crowds were sparse as well. Absence of tourists however was more than made up in biomass for by swarms of hungry mosquitoes. They were too slow to keep up with us as we were setting up, but made their presence known immediately as we started pouring the first plate and had to stay still. While developing one of the plates you see below, one of the little blood-suckers landed right inside my ear. 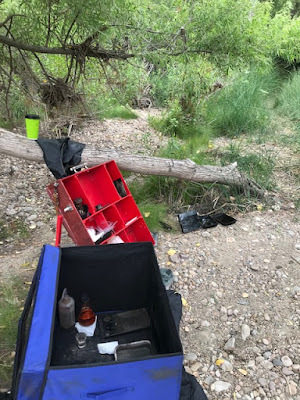 I heard him fly up, I felt the bite start, I felt it all the way through, I heard him fly off… My arms were inside the film changing bag sleeves and my face buried in the snorkeling mask that acts as a window in my dark box. I was completely defenseless for approximately a minute, and that little guy knew it, picking time to start his attack with precision of a four-star general. I was robbed of a few drops of my blood, but in the end walked away with these plates, so I think it was worth it. In order to skip LA traffic we didn’t stay another night at Will’s, just swung by for a bit to show our haul of plates and to say our goodbyes. We left about 10-11pm and I didn’t get back home till 4am, but it was well worth the lost hours of sleep – driving through Los Angeles at any time other than 1-5am can result in many endless hours of sitting in bumper-to-bumper gridlock. 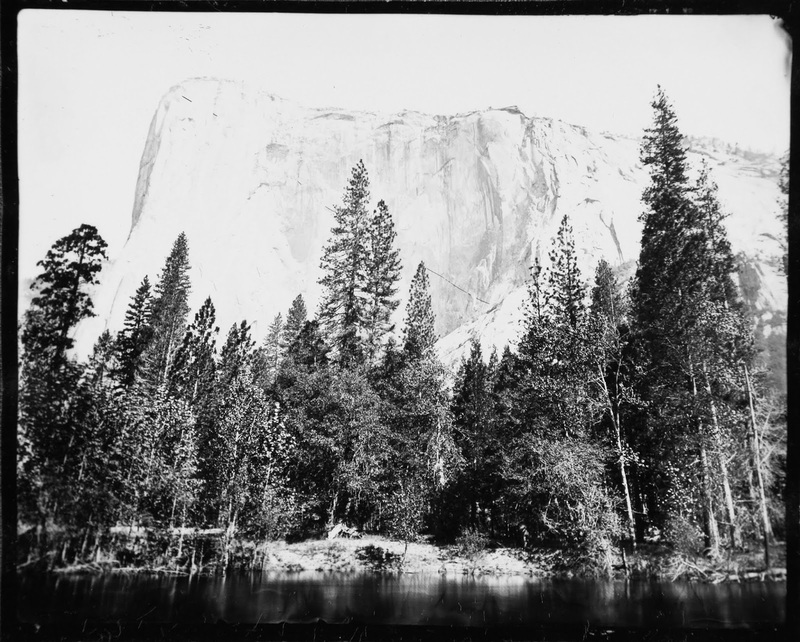 Yosemite is too close though not to go back, so in the future you might see more posts about excursions there.